Chausses are known from the XI century as main part of men's costume. Etimologycally, the word "chausses" is connected with French verb "chausser", that means "put shoes on" or "to shoe". In Medieval Ages, tight stocking was being called the chausses, and they were specific both for men and women (chausses had been hidden under the long dress). This model of chausses are being cut on the bias, that allows to make them rather tight on the legs. There are leather string on the top of the chausses, with what you can fasten chausses to the holes in braies or to the fabric belt. Chausses are being worn with braies and cotta. They are a part of soldier's costume. Different fabrics and colours are available for order. In depictions of early medieval period we can find that women wore stockings and korthoser as well as men. They were knee-lenght and fastened with a garter usually made of leather. We offer nice looking medieval women's stockings are made of 100% natural cotton. Even if they are not visible under your dress but will perfectly fit your legs and keep warm. If you want to order them are made of wool or linen in different colours, please contact us [email protected] .. Traditionally braies were a baggy fitting underpants which was fastened at the waist with a lace that allowed to determine the length. 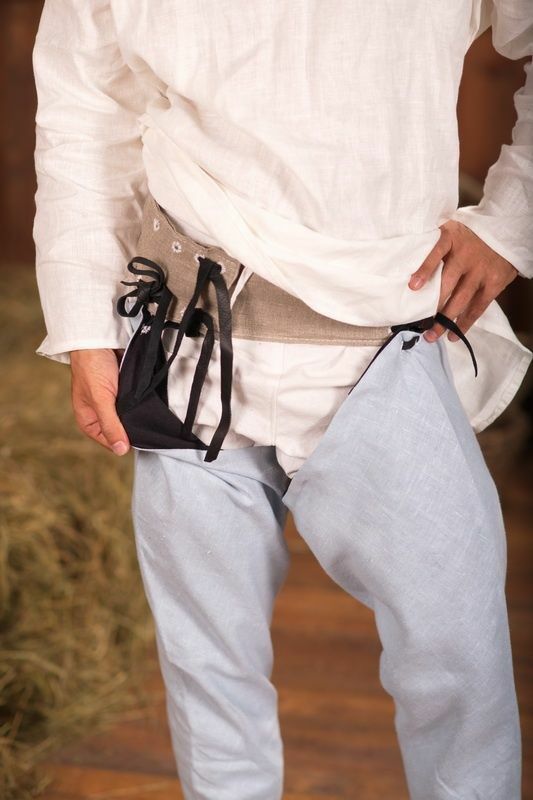 This model of medieval men's braies is knee-length and can be made of 100% natural linen or cotton. Undershirt will go favourable together with this undergarment. We sew it of white or natural coloured cotton or linen. If you wish other colour, please contact us at [email protected] .. The item is historically correct model of pants that Danish countrymen had worn in the XIII-IX cc. Pants are wide on the thighs and have drawstrings on the calves. Combined with shirt and cotta, they create a fantasy-world character - dwarf. You can order it in any colour and in the following material: linen, cotton, wool. Boots and axe are not included to the price of the dwarf costume. .. Pants with drawstrings on the waist are the part of warrior costume. Rather open cut will provide you with freedom of movements. Coming with shirt and cotta, the pants will create your individual fantasy style character of warrior. You can order it in any colour of different material. ..
Chausses are known from the XI century as main part of men's medieval costume. Etimologycally, the word "chausses" is connected with French verb "chausser", that means "put shoes on" or "to shoe". Usually, men worn long chausses with fastenings on the top, but short chausses were popular as well. In Middle Ages men rolled chausses a la modern stockings to the level of middle calf, and fixed chausses with string. This model are higher the knee and are tied under the knee. Long cotta will be a good addition to these chausses. Base price includes chausses of cotton, but we can make them also of linen or wool. .. Some models of medieval men' chausses had not only one-piece toe, but footstraps as well, that were making chausses hard-wearing and comfortable. This model of chausses was very popular in XII-XV centuries. They are being cut on the bias, that allows to make them rather tight on the legs. There are leather string on the top of the chausses, with what you can fasten chausses to the holes in braies or to the fabric belt. Long cotta will be a perfect addition to the chausses with footstraps. Different fabrics and colours are available for order. ..